Chances are they never even knew of each other’s existence. And why would they? The year was 1969. Nick Drake was a six foot three inch product of the British public school system and Cambridge University, and would release his first album, Five Leaves Left, later that year. Jean Weston was a tiny, five foot one inch brunette who worked in the alterations section of Gamage’s department store in Holborn, central London. Jean had just been voted Miss Gamage and as a result had made it through to the final of the ‘Miss London Stores’ contest. Incredibly, over 40 years later, their stories are linked, in an important way, as the shapely Jean, with her 34-23-34 figure, is a vital clue in helping us to date accurately, for the very first time, the precise day of Keith Morris’s Five Leaves Left cover shoot with Nick Drake. But first, does anyone really care about this kind of stuff? Hell, yes – historical accuracy is important. For me one of the big exercises behind Ormond Yard Press’s new book I saw Nick Drake: photographs by Keith Morris, has been to validate as many dates and facts as possible as far as they relate to Keith Morris’s photo-sessions with Nick Drake. When you read the existing published biographies of Nick Drake, you learn the accepted wisdom that the Five Leaves Left session took place on budget day 1969, as evidenced by the fact that some of Keith Morris’s photographs taken that day show a budget poster on display. Budget Day in 1969 was Tuesday 15 April. You can see an example alongside. The problem is that the appearance of that poster doesn’t necessarily mean the Five Leaves Left photo-session must have taken place on Tuesday 15 April 1969. That budget poster could quite possibly have stayed up for a few days after the budget. So as part of the research for our I saw Nick Drake book, could we get some certainty on that date? Our fact finding challenge generally with I saw Nick Drake was that we were researching a photo-shoot that took place in 1969 where only two people were present, and both Nick Drake and Keith Morris are sadly no longer with us. Nick Drake has never gone on record discussing the Five Leaves Left photo-shoot. Keith Morris has talked about the session, but only many years after the event, and memories can play tricks after the passing of so much time. So on the face of it, our inability to probe directly the principal protagonists might appear to be a very restricting factor. In practice, it actually makes us work harder with the resources that are at our disposal. The trump card we have, the ace in the hole, is that we can subject Keith’s archive of photographs from that session to a much greater degree of scrutiny than has been possible before. Here’s where it gets interesting. You know that moment in The Girl with the Dragon Tattoo when Mikael Blomkvist is going through the newspaper photo-archives and discovers a sequence of images from the Childrens Day Parade in 1966 which helps him unlock the secret of Harriett Vanger’s disappearance? I love that kind of stuff, and as luck would have it, we had one of those goose-bump moments on this project. 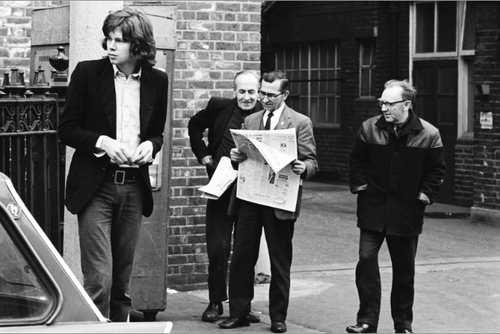 One of the photographs taken by Keith Morris that afternoon shows Nick Drake standing next to a group of three men, and one of those men is holding a newspaper. His attention, and that of his colleague peering over his right shoulder, is firmly rooted to the sports section on the back pages. That is very helpful to us because it means that the front of the newspaper is pointing towards the camera. As soon as I saw that photograph, the challenge became crystal clear. If we could track down a physical copy of that newspaper held by the man in the photograph taken by Keith, then we could date the shoot with a high degree of certainty. Luckily Keith’s original negative of this photograph survived, and we were able to make a high resolution scan of that image, blowing up the headlines and images. That certainly helped. 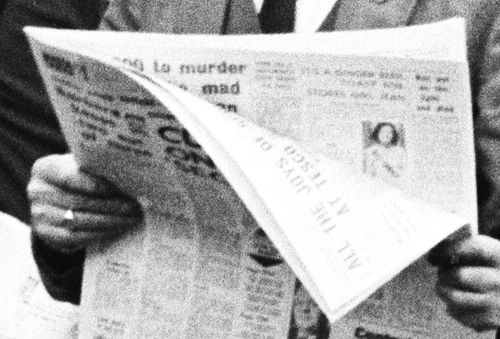 As you can see from the close up extract, the detail is not sufficiently clear for us to read the date of the newspaper directly, but we do get a tantalising view of a section of the front of the newspaper, and part of a left hand and a right hand interior page. These are details that have never been put under the microscope before. If you look at this close up section, you can make out a headline featuring Tesco on the left hand page – the words ‘All the joys of…’ and then ‘at Tesco’ are legible. You can also just make out an article on the right hand page, featuring what looks like a picture of a lady with a sash around her torso and a headline which seems to refer to ‘ginger beer toast’. Further research confirmed that the newspaper in the photograph was too large to be the Evening Standard, and was in fact the Evening News. We were getting closer. We just needed to find the physical example of that newspaper so that we could match it up. A session at the British Library’s newspaper archives struck gold. On microfiche in their archives we discovered what we were looking for. That is where Jean Weston comes in, and gives us the evidence that the photograph was not actually taken on Tuesday 15 April 1969 after all. Let me introduce you to the lovely Jean. It’s the same picture that appears in the article held by the man in the Keith Morris photograph – but you can’t see all of it because of the way the paper is folded. The article in the paper is titled “IT’S A GINGER BEER TOAST FOR STORES GIRL JEAN’. Pretty 22-year-old Jean Weston drank a toast to herself in ginger beer when she heard she had been voted Miss Gamage. “I needed it – I never thought I would be the one,” said Jean, a tiny 5ft 1in brunette with a 34-23-34 figure. Jean, who was picked from several other girls at the Holborn store, is a fashion alteration hand with the fashion department. She chose a carefully tailored dress in white French lace for the contest. A bride of five months, she said, “My husband will be delighted when he hears the news-though I can’t imagine his reaction if I was lucky enough to go to Tokyo!” She joins the other stores’ beauties in the finals of the Miss London Stores contest to be televised in May. The contest-with a trip to Tokyo and £600 of gift vouchers as first prize-is part of the second Festival of London Stores, jointly sponsored by the Evening News and Evening Standard. Fulham born Jean has already travelled abroad, but she said: “I really think London stores are the best.” Jean and her husband live in West Hampstead but they have an ambition to open a music shop somewhere and live on the premises. So we had it. And so to the all important question, the date of the Five Leaves Left photo-shoot, printed in top corner of the newspaper? So let me say a big thank you to the lovely Jean. I don’t know if she won the competition, or opened her music shop, but it is down to her that we were inspired to follow this research through to its conclusion and add some certainty to one small but important aspect of the Keith Morris / Nick Drake story.